Husband to Anna Emeilie (nee Manz), married October 14, 1899. 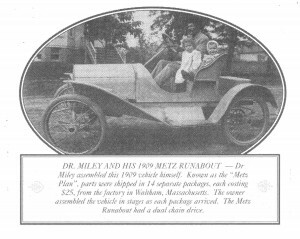 1907-1914 Henry Thielman and Dr. Miley were strong advocates for Hard Roads (gravel roads) and wrote many interesting newspaper articles on the subject. If you would like to read some of their articles, click on the link below. Michael R. Miley, M.D., of Beecher, is a representative member of the medical profession of Will County and a leading citizen of the community in which he lives. He was born in Wisconsin, Nov. 28, 1858, the son of Theodore and Anna (Ritter) Miley. Both Theodore Miley and his wife were natives of Switzerland. Their marriage took place at Madison, Wisc., where they had both located early in life. 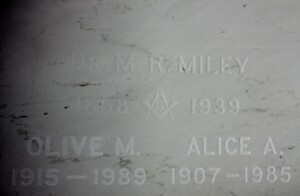 Mr. Miley was a successful farmer until the time of his death, which occurred about 1886. His wife died in 1880. Both are buried at Alma, Wis. Mr. and Mrs. Miley were the parents of seven children, two of whom survive: Michael R., the subject of this sketch; and Julia Blum, who lives at West Palm Beach, Florida. Michael R. Miley spent his boyhood in Wisconsin and was educated in the public schools there. 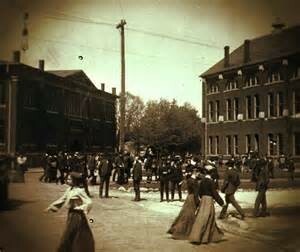 He later attended Valparaiso University and in 1896 was graduated from Rush Medical College. He spent a year in private practice in Chicago, and then located at Beecher, in August, 1897. 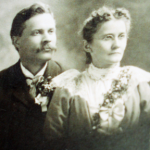 On Oct. 14, 1899, Dr. Miley was united in marriage with Miss Emily Manz, a native of Wisconsin. They had the following children: Alice, Bernice, and Olive, all at home; and Milton, who died in infancy. Dr. Miley is a republican and has served as mayor of Beecher for two terms. He has been a member of the school board for 27 years. He is identified with the Will County Medical Society, and Illinois State Medical Society. He is a member of the Lutheran Church, and is affiliated with A.F. and A.M. No. 1087, Beecher, and Modern Woodmen of America. Dr. Miley is widely known in Beecher and takes an active interest in the social and civic life. We print herewith a photographic reproduction of Dr. M. R. Miley’s new residence, which was completed last fall and is now occupied by the doctor and his family. 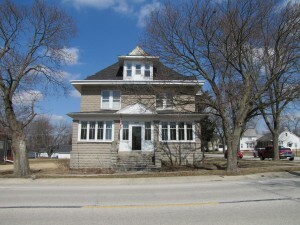 The residence, which is one of the most beautiful and substantial in Will County, is situated on the northwest corner of Indiana and Catalpa streets. It is a two-story building. 40×52 feet, has 12 rooms and a basement, besides a generous number of closets, halls, etc. The house is modern in every way, having hot and cold water, bath, furnace heat, individual gas plant and everything essential for convenience and comfort. On October 31, 1909, the firm of Hoff and Wiggenhouser were ordered to manufacture during the winter enough panel-faced concrete blocks to build a good sized house, the exact number and special forms of blocks to be determined after an architect had drawn up plans and specifications. In February, H.F. Balgemann of Eagle Lake was engaged to draw up the plans and specifications, which were furnished in the later part of May and according to which the present structure was erected. Wm. Osterneier started excavation for the basement on June 15th and Wm. Ohlenkamp and Wm. Ruwaldt dug the necessary drains, cesspool, and ditches for concrete footings. 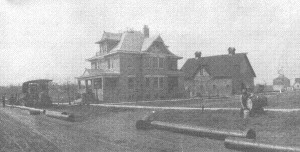 Hoff & Wiggenhauser kept making the different blocks for basement, and up to the water table, the water table itself and the sills and caps for doors and windows, and on July 2nd began to lay the footings and erect the building. Their work and the painting and varnishing proved the most satisfactory of all the work connected with the building. 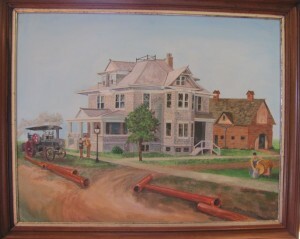 Dr. Miley’s House @ 1909 , Painting at the Beecher Historical Society museum. Artist: Norma ? The carpenter work was done by Henry Hunte, assisted by Herman Siems and his two sons, Albert and Carl Hunte, and was begun August 4th. The roof was made of Asbestos Century shingles, made by Keasby & Nattison of Ambler, Pa., and so far proved very satisfactory, giving a pleasing effect and making a good roof. The plastering was done with wood mortar and a hard finish by Fred Lorbach of Peotone and Wm. Warneke. Instead of the laths, Sackett plaster board was used and thus far has proved quite satisfactory. Emil Koch and Henry Wehmhoefer did the work and supplied the material for the metal required, such as tin gutters, tin decks, cresting, etc. The plumbing and installing of the hot water heating plant was done by Jirtle & Somes of Chicago Heights. The Plumbing as far as in use, has been satisfactory, but cannot be put to a proper test until the village has installed its water works. The heating plant (Spence hot water heater) has not been properly installed and hence one cannot tell what kind of satisfaction it will ultimately give. The painting and varnishing was done by Chas. Adolph, assisted by his two sons and Charlie Cook, and is of excellent workmanship. Wm. Schultz did part of the outside painting, but illness kept him from completing it. The lumber and mill work was secured from Wilke & Ruge, the latter being supplied by True & True Co. of Chicago, and very good material was supplied throughout. By erecting this fine residence in Beecher, Dr. Miley has shown confidence in the future of our village. He believes that in the course of a few years Beecher will be a suburb of Chicago and that it will be the home of those who desire to get away from the whirl and noise of the city. The residence is a credit to the village and a most comfortable home for the doctor and his family. While trimming a tree at his residence, Monday afternoon, Dr. M.R. Miley sustained an injury which will probably incapacitate him for some time. He was in the act of cutting a limb from the tree and was coming down from the ladder to change his position, when the limb gave way and knocked him off the ladder to the ground. He was discovered by a passerby laying on the ground unable to get up. 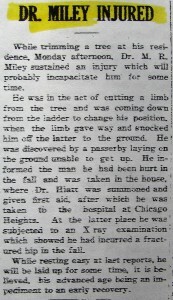 He informed the man he had been hurt in the fall and was taken in the house, where Dr. Hiatt was summoned and given first aid, after which he was taken to the hospital at Chicago Heights. At the latter place he was subjected to an X ray examination which showed he had incurred a fractured hip in the fall. While resting easy at last report, he will be laid up for some time, it is believed, his advanced age being an impediment to an early recovery. 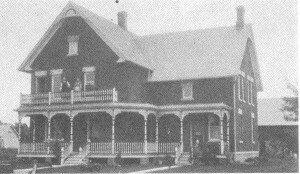 The regular monthly meeting of the Village of Beecher was held at the Village Hall, August 3, 1936, at 8 o’clock p.m.
Meeting was called to order by Pres. Batterman. Trustees present – Guritz, Riechers, Wehling, Klein, Tramm, Wiggenhauser. Minutes of the last regular meeting were read and upon motion by Trus. Klein, seconded by Tramm, the same were approved as read, upon the call of the ayes and noes, all voting aye. Motion by Wehling, seconded by Riechers, that the Board take a recess to allow finance committee to consider bills and also to compare Clerk’s and Treasurer’s books. Carried. The finance committee reported verbally in favor of paying the above bills. Motion by Tramm, seconded by Guritz that said bills be allowed and that warrants be drawn for same. Carried. Motion by Guritz, seconded by Wiggenhauser, that Clerk’s and Treasurer’s books be certified as being correct, Carried. Motion by Klein, seconded by Tramm, that Building Committee be given power to act with regard to painting and papering Village Hall. Carried. Motion by Klein, seconded by Wehling, that Levy Ordinance No. 261 be accepted and adopted, Carried. Motion by Klein, seconded by Riechers, the Dr. M.R. Miley be appointed Health Commissioner for the fiscal year. Carried. Motion by Tramm, seconded by Klein, that meeting adjourn, Carried. One of the most outstanding citizens of this community peacefully passed into the great beyond, when Dr. Michael R. Miley closed his eyes in death, Sunday morning, at about 8 o’clock, at his home here. Due to advanced age, the doctor had been in failing health for some time, and for about a week before his death, he was unable to take nourishment. The end was imminent when he took to his bed, last Wednesday, and calmly awaited the final summons. He attained the age of 80 years, 2 months and one day. 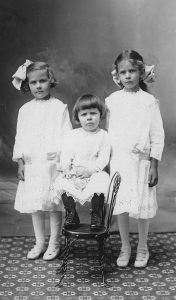 His sorrowing wife and daughters, Misses Alice and Olive were at the bedside. Another daughter, Bernice, (Mrs. A. Anderson), of Idaho was unable to attend the funeral. She visited her father during a recent illness, however, when she submitted to a blood transfusion in order to prolong his life. The funeral services were conducted. Wednesday, with Rev. G. Horst officiating at the residence. The local Lodge No. 1087 A.F. & A.M., of which he was an active member, was in charge of a service at the Beecher Mausoleum, where the remains were laid at rest. The deceased was born in Wisconsin, Nov. 28, 1858, the son of Theodore and Anna Maria (Ritter) Miley, natives of Switzerland. Of a family of seven, one sister, Julia Blum, of West Palm Beach, Florida, survives to mourn his passing. He spent his boyhood in Wisconsin and was educated in the public schools there. He later attended Valparaiso University, and in 1896 graduated from Rush Medical College. In the meantime be had taught school for fifteen years in Wisconsin, Iowa and Michigan, and held a life teachers certificate from Wisconsin. 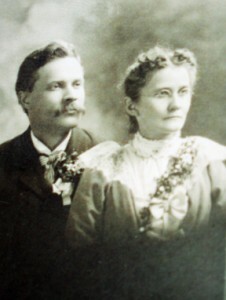 He located in Beecher in August 1897, and was united in marriage with Miss Emily Manz, a native of Wisconsin, October 14, 1899. This union was blessed with the three daughters, already mentioned, and a set of twins; Mary and Milton C, who died in infancy. As we look over the career of Dr. Michael R. Miley, he may well be termed a philanthropist in local circles. 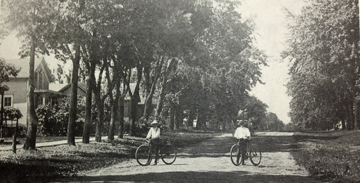 Arriving in Beecher on a bicycle in 1897 is typical of the man with iron nerve, who, it has been said, ‘slept with one eye open’; who thrived upon surmounting obstacles, especially in the early days of his career. As a physician in those early days, Dr. Miley gained the love and respect of this community by untiring efforts to conquer the many handicaps in travel and communication in an effort to best serve the medical requirements of the sick. In order to further his efforts in this direction he installed a private telephone system and built up a practice covering a territory some ten miles in extent, which was a wide expanse in those days. Throughout his long career he maintained his arduous efforts to serve by active practice and persistent study. While attending closely to the medical requirements of the community, he also found time to serve Beecher in a most auspicious manner in municipal and educational affairs. 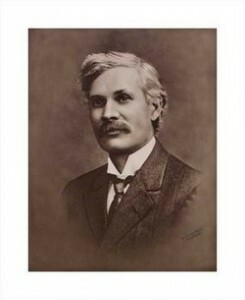 In 1902 he was elected president of the Village Board, and during his administration the village made more progress than ever before in its history. It was during Dr. Miley’s administration that Beecher built the greater portion of her cement sidewalks, the ordinance against wooden sidewalks being passed at this time. Over a mile of macadam streets were also built during this period. Many other improvements including the installation of a lighting system were introduced, and he advocated water works and sewer systems. Although he declined re-election at that time he served another term as head of the Board in later years and always maintained an active interest and persistent desire for a better Beecher. He held the office of Justice of the Peace for many years up to the time of his death. In educational affairs, he served as a director on the school board for thirty-four years, and was clerk at the time of his demise. 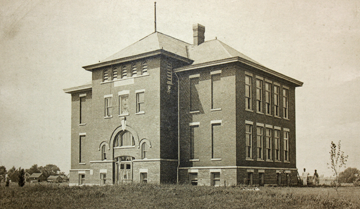 He was always strongly in favor of a new school building, and gave much of his personal time and effort in not only conducting the affairs of the local district, but also in beautifying the school property. The large grove of trees on the school grounds is a specific example of his great personal interest in the local public schools. In passing of Dr. Michael R. Miley, Beecher and community mourns a citizen who dedicated his life to the betterment of his community, to whom the community will ever be indebted; who never failed in his efforts to help his fellow man; whose works will ever be a model to stimulate the efforts of future citizens. His life was not spent in vain. May his reward be great! This entry was posted in Automated Burial Listing, Beecher Lodge 1087 AM & FM, Burial Listing, Burial Location, Freemason (Masonic Lodge), HEADSTONE, Moderan Woodmen of America, Obituaries- Have Full Copy, Public Service, Village of Beecher board member by Sandra. Bookmark the permalink.